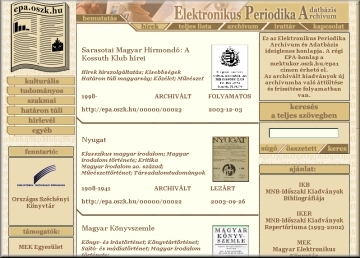 The Electronic Periodicals Archive & Database (EPA) is the initiative of the Hungarian Electronic Library (MEK) aimed at creating a bibliographic database and register of the Hungarian e-periodicals and providing hosting services to certain ongoing resources. The main task of the EPA-services is to produce and maintain a centralized, well-organized and searchable database of the metadata and access information of the Hungarian e-journals, and to promote the publication and distribution of these resources, with technical support and good practice standards, thus providing better access to this type of content. Numerous free-access Hungarian or Hungary-related periodicals can be found at the world wide web with high-quality content. The Hungarian Electronic Library has been maintaining a simple register of the electronic journals since the middle of the nineties. By the end of the decade more than 1300 periodicals have been registered in the list under 15 thematic groups. In addition to the periodicals, several hundred online index-services has been included into the periodicals section of the MEK's virtual collection. These lists can be regarded as the predecessors of the current service. During the building of the virtual collection, we were forced to face the problem of the ever-changing nature of the Internet, and the fact that access to e-periodicals is far from stable on the long run. Several of the commercial services that hosted most of these resources often ceased to exist after a short time. Other efforts of web-based distribution depended on a single staff member, in the case of his or her departure the electronic publication of the resource came to an end. To answer this challenge, the MEK and the Hungarian National Library started to collect, store and make available free-access periodicals on the web with full content, based on mutual agreements between the library and the publishers of the resources. The development of the "Electronic Periodical Archive" started in 2003, first with the foundations of the host service stored on the MEK-server. Most items of the collection have their own web sites as well, but some of them can be found exclusively in the EPA Archive. The advantages of the hosting in the EPA services are stable access, uniform technical standards and design principles. Further, full-text search has been successfully enabled in the majority of the HTML- and PDF-format materials. The archive is rapidly growing with new acquisitions, as well as with the regular updates of resources that are already part of the collection. 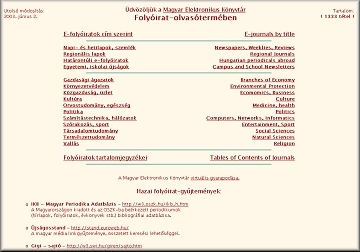 The new database of the Hungarian e-periodicals available on the web opened in summer, 2004. 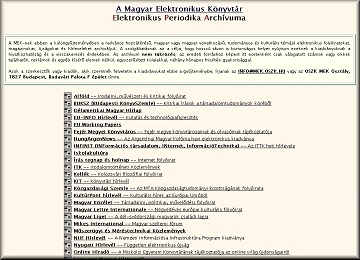 This register stores the bibliographic data and access information of the Hungary-related e-journals. The inclusion of the descriptive data of electronic resources on offline (CD, DVD) formats is planned. The database resembles a library catalogue, in the nature of the descriptive elements and their appearance. Useful additional information is added to each record (i.e. related resources, search URLs). Users can search the database by title, available years, subject, type and access method. With the expansion of the register, the EPA hopes to provide a comprehensive gateway to the world of the Hungarian e-media.